Minecraft is the most popular game in PC history, with hundreds of millions of players, and it’s now a gateway into the programming world. 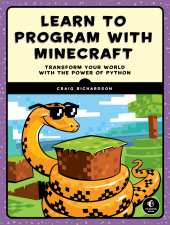 In a novel approach to teaching programming, a new book from No Starch Press, Learn to Program with Minecraft ($29.95, Dec. 2015, 320 pp.) uses Minecraft to introduce fans to the beginner-friendly Python language. Readers learn how to build dazzling creations and unlock a whole new realm of Minecraft, all while learning practical programming skills. This hands-on approach to programming is filled with fun, step-by-step directions designed to make things clear for readers of all ages and experience levels. Author Craig Richardson explains his book’s unique approach this way: “My book makes learning to program accessible and engaging for people of all ages. Parents and teachers know how valuable it is to learn how to program, but add the fun and creativity of Minecraft while giving your player superpowers, and who can resist? For parents looking to get kids interested in coding, and for Minecraft fans of any age, this hands-on guide is the perfect introduction to programming. The code in this book will run on Mac, Windows, and Raspberry Pi. Learn to Program with Minecraft is available now in bookstores everywhere. This entry was posted in 2, Developer, game, games, Games Developer, job, Jobs, train, train 2 game, Train2Game, www.train2game-news.co.uk and tagged 2, coding, developer, game, games, Games Developer, games industry, Learn to Program with Minecraft, Minecraft, No Starch Press, Python, train, Train2Game by Train2Game Blogger Team. Bookmark the permalink.